The longer rear-facing position (and the only position in this seat) provides extra safety to the child. CONCORD Reverso (Isofix + i-Size) is a safe seat that can be used for newborns with an insert but cannot be used as a carrier. The seat can only be used with Isofix and support leg, installing with seat belt is not possible. The seat can be used up to 105 cm (change of seat has to be made according to height and not weight). It is a lightweight seat (10.9 kg together with the newborn insert, without it only 9.9 kg), compared with other seats at a similar size, thanks to its aluminum frame and multifunctional shell. You can adjust the support leg with one hand and it has a red-green indicator to show if you have mounted it perfectly. Choosing between the sitting or lying position can easily be accessed and changed. Seat insert for newborns is included. The large and permeable louvres help good ventilation at the back of the seat. Older children can have a high sitting position for better view. The impact plate stabilizes the seat and children tend to rest their feet on it. The plate adjusts automatically to the shape of the seat. Additionally, an isofix snap fitting aid can be put on to protect the car’s seat covers and also to make the attachment easier to the vehicle. However, it is not necessary for perfect fitting. Summer cover can be bought for the seat to protect the seat and to make it more comfortable for the baby. IMPORTANT: long-term usage can cause the belt adjustment’s mechanism negative effect, so Concord provides protective caps for free. For further information, visit their website here. 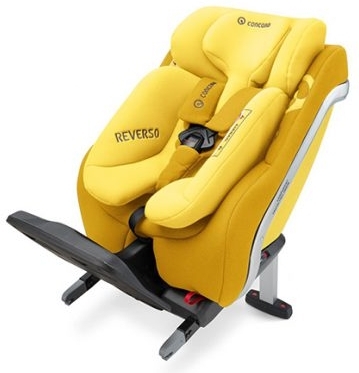 I hope you liked this review and if you have any question about the CONCORD Reverso (Isofix + i-Size) seat or want to leave your own personal experience, leave a comment below.